Posted on March 21, 2014 at 6:16 pm. Editor’s note: Charles Bidwell is a GeriActor, a retired minister, a teacher, and an activist. Here is an entry by Charles about the GeriActors and Friends and intergenerational art. Tell us about your experience with the GeriActors and Friends. GeriActors and Friends (G&F) has been a highlight of my week for four years now and I wouldn’t miss a meeting on Thursdays unless I was ill or on vacation. The spirit of comradeship and playfulness of the other members enriches my life. From the improvisation activities that spark our imaginations and foster creativity to the crafting of stories into scenes or playlets based on issues or themes in our lives, we share a common bond of enjoying each other’s contributions and giving ourselves permission to be child-like in our playfulness. Good humour abounds and the snack times are treats prepared with love that put the icing on the cake of our playtime so to speak. 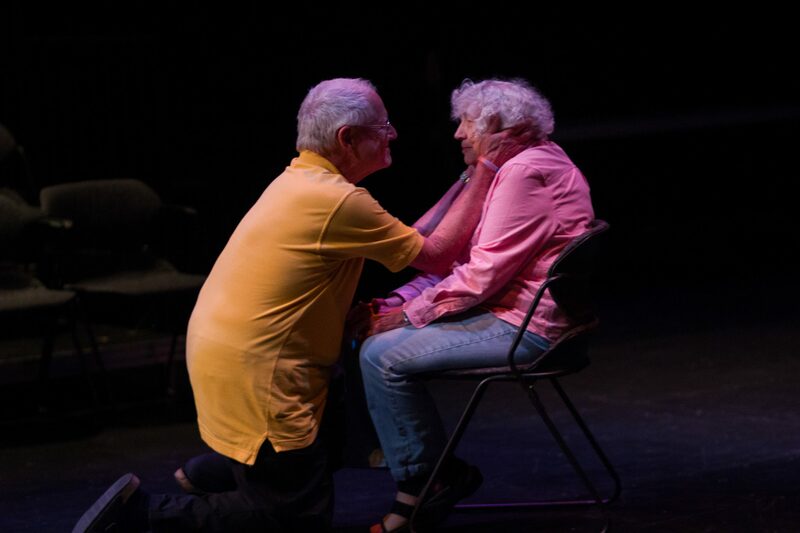 I have been stretched by participating in several G&F workshops for seniors such as clowning, musical theatre, dance, performance storytelling and comedy improvisation. I have been happy to play roles in scenes we take to seniors’ centres and housing locations. It is interesting to discover what memories our scenes evoke in the members of the audiences; they seem to light up as they share these memories with us after our performances. I have been privileged to lead a Performance Storytelling workshop and witness the spark that ignites the seniors as they play games and share stories from their rich life experiences. Who would have thought that at age 77 I would be an acting coach or mentor! Could you share a bit about the process of creating intergenerational art? Working/playing with a variety of people is always interesting when they come from different perspectives and life experiences. 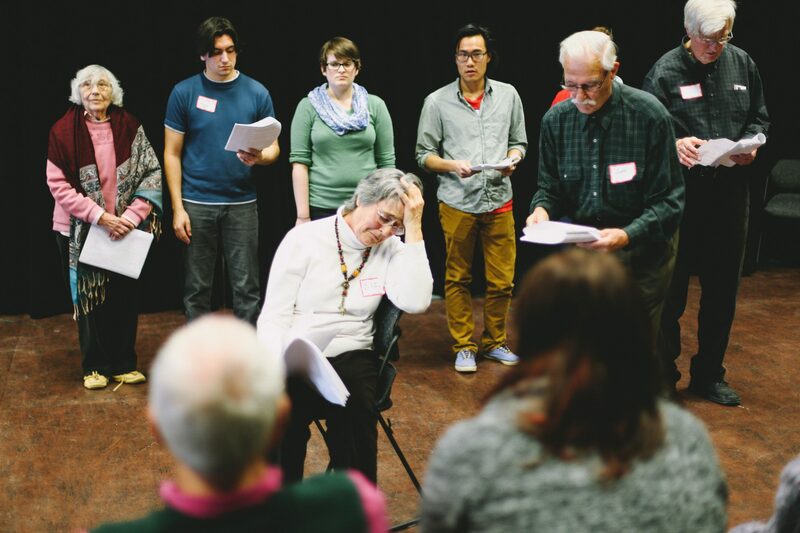 The seniors in GeriActors come from different countries and career paths and they bring that diversity of experience to the circle when we play improvisational games and tell stories from our lives. I had only known mono-generational acting groups (high school drama club and later in amateur theatre groups) until now. The difference I have experienced is that within our intergenerational group there seems to be a more playful atmosphere. Perhaps this is because we are not trying to impress or out-perform our peers or because the director has always encouraged impromptu play at the beginning of every Thursday meeting and workshop gathering. The university students come with such enthusiasm that it is inspiring and energizing to us seniors. They in turn get an opportunity to share with us the theatre skills they are developing. I have found that both generations have been moved beyond stereotypical generalizations about members of the other generation. Even the high school students we have interacted with shared their appreciation for getting to know, even briefly, the seniors in our playful mode. Where do you see the GeriActors in the future? I think as we (G&F) mature we might form a couple or three troupes in addition to the current historic group of Thursday gatherings. The membership of these groups would be open to more folks than we can accommodate in the current troupe. One might be an improv-focused group – The GeriImps? Another might be a group interested in rehearsing and performing pieces more often than we do now – The GeriPlayers? This performing troupe might also incorporate pieces involving expressive movement/dance. It used to be that we had only one person taking a leadership role and that limits what can be done. We are now mentoring and offering leadership experiences to others and so branching out to form another group is more realistic. More frequent workshops are another area for growth and expansion of the public’s awareness. I look forward to expanding our reach out to more seniors through providing more workshops in different locations and running a full-year, weekly drop-in drama group at the city centre Seniors Association of Greater Edmonton to make playing acting experiences accessible to more and more seniors. Posted on March 11, 2014 at 4:10 pm. Editor’s Note: The GeriActors and Friends are filming a Documentary! Here is a glimpse into the filming experience by Bill. Support, open, safe, vulnerable and invigorating: these were the words that the GeriActors and Friends used to describe themselves this weekend as the company reflected on their process and its impact on their lives. This Saturday and Sunday we began filming the G&F documentary as a part of a research project with the Canadian Institute of Health Research and the U of A’s Human Ecology Department on how theatre is the pathway to healthy ageing. The film will feature interviews from GeriActors and Friends about our experience and thoughts about the company, an audience talkback and our three original plays Prodigal Son, Felixstowe and Lear. GeriActors and Friends performing Lear at Holiday Party. It was an inspiring two days as both the seniors and students asked ourselves the questions that brought us together: What makes the GeriActors so unique? What does intergenerational mean to us? In what ways has art and theatre enriched our lives? Although everyone had their own unique reasons for joining and how it has affected their lives, we had all come to consensus that what makes the GeriActors unique for us was its supportive, open, safe, and vulnerable yet invigorating environment. Here we can feel safe to bring our stories, the challenges we face in life and utilize theatre as a medium to explore, understand and appreciate. During an interview I was asked if the GeriActors had a performative style. I was startled as I knew that the GeriActors had a very unique way of acting, but had never really compared it to anything else. “They are story-based actors” I said. Every gesture, every line, every emotion they portray reinforces the story, the story is the precedence of everything. I realize that as an actor, sometimes I would get all caught up on HOW I would tell the story, that I began to neglect WHAT the story is, and more importantly WHY the story needed to be shared. A lesson I have taken from the GeriActors: to never lose sight as to the significance and impact of the story I am sharing.